Backers of President Mugabe's wife tell the army chief to stay in barracks after takeover warning. Allies of Zimbabwe’s President Robert Mugabe have warned the military chief against meddling in politics. Gen Constantino Chiwenga had said the army was prepared to intervene to end purges within the ruling Zanu-PF party. His comments came a week after Mr Mugabe sacked his deputy Emmerson Mnangagwa, who has fled into exile. 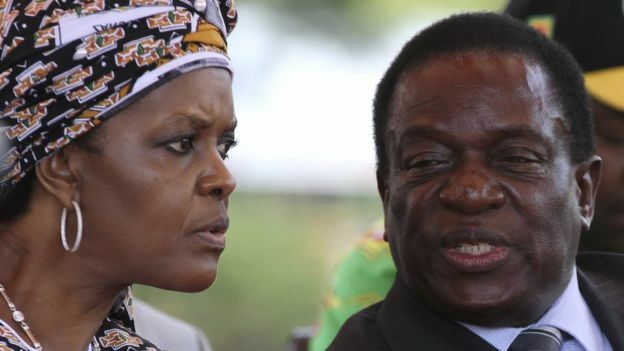 But the Zanu-PF’s Youth League, which backs President Mugabe’s wife Grace to replace Mr Mnangagwa, told the army chief to “stay in the barracks”. Meanwhile, BBC correspondents in the capital, Harare, report that a few armoured vehicles have been seen on a main public road outside the city having left one of the country’s main military barracks, Inkomo. It is not clear where they were heading but they have not been seen on the streets of Harare. One of the vehicles had broken down on the side of the road. The leader of the Zanu-PF youth wing, Kudzai Chipanga, said his members would not allow the armed forces to subvert the constitution and were prepared to die to defend President Mugabe. He told a press conference in the capital, Harare, that the military chief did not enjoy the support of the “entire defence force”. “We will not sit and fold hands while threats are made against a legitimately elected government,” he said. Gen Chiwenga appeared at a news conference on Monday with another 90 senior army officers present. He had said the “current purging” that targeted “members of the party with a liberation background” should stop. The country’s state-linked media have observed a blackout on his remarks – the Herald newspaper took down an article it had initially posted on its website about his warning, the Zimbabwe Mail reports. Mr Chipanga also asked the general to account for some $15bn (£11bn) of diamond mining revenues, which President Mugabe said last year was missing from state coffers, blaming foreign mining firms. The BBC’s Shingai Nyoka, in Harare, says at one time there was a partnership between the army’s mining company and a Chinese firm that was prospecting in the rich Marange diamond fields in the east of the country. The ongoing tussle within Zanu-PF is about who will succeed President Mugabe, who is 93-years-old. Its youth wing backs Mr Mugabe’s wife Grace, who is now the favourite to succeed her husband. She has referred to the sacked vice-president as a snake which “must be hit on the head”. Mr Mnangagwa, nicknamed the “crocodile”, has rebuked Mr Mugabe, saying Zanu-PF is “not personal property for you and your wife to do as you please”.